“Kolar Gold Fields – Down Memory Lane” undertakes a nostalgic journey of almost 150 years, beginning with the historical and mythological origins of the Kolar Gold Mines. The book focuses on the progress through the years under the John Taylor and Sons Company, the gradual decline, and final closure of the once prosperous Kolar Gold Mining Company, in 2003. Authored by Bridget White-Kumar, born into an Anglo-Indian family, who lived in KGF for many generations, the book recalls the cosmopolitan life led by the tiny vibrant Anglo-Indian Community in the early days of KGF. It also focuses on the author's childhood memories of growing up in KGF in the 1950s and 60s. Kolar Gold Fields was well known for its colonial ambience and was called ‘Little England' due to its British and Anglo-Indian population. It was one of India's earliest industrialized towns and was unique for its secular and egalitarian society. The book succeeds in capturing and preserving the ethos and nuances of a bygone era. 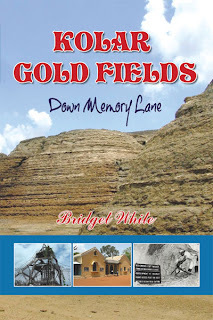 This book is a 'must have' for all those who lived in Kolar Gold Fields and would like to preserve their memories of KGF forever.